The College of Saint Benedict and Saint John's University offer you two nationally recognized liberal arts colleges for the price of one. 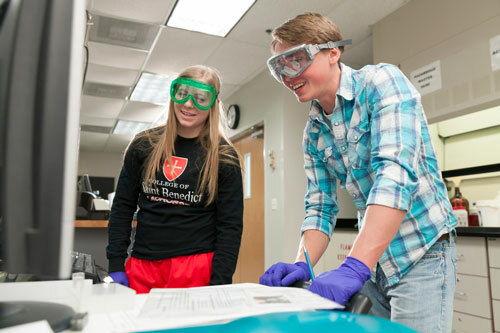 Our unique partnership gives students the educational choices of a large university while enjoying the individual attention and community of a premier small college. We offer an extraordinary sense of place and belonging that shapes the undergraduate experience and creates a lifelong network of alum connections. We're ranked among the top baccalaureate institutions nationally in the number of students who study abroad. These experiences prepare our students for leadership and service in a global society. We support a vibrant environment for the performing and visual arts that contributes to culture, community and creativity. Our learning experiences are enlivened by Catholic and Benedictine traditions of hospitality, stewardship and service. We embrace these timeless values while encouraging independent thinking and the lively engagement of faith and reason. Our campuses are located six miles apart in central Minnesota, surrounded by more than 3,000 acres of pristine forests, prairies and lakes. The colleges are minutes away from the St. Cloud metropolitan area, with a population of more than 100,000, while Minneapolis and St. Paul are 70 miles southeast on I-94.